I have a confession to make. Don’t be mad, okay? When I first unveiled my new food blog, the first thing my dad said was, “That’s a little precocious, isn’t it?” Maybe. I just didn’t see the point in using 16, since my birthday is in 2 1/2 weeks (!) and I figured I would just have to be a bit misleading for a month. It’s a little weird only being 16 – with a few exceptions, I’m one of the youngest food bloggers I’ve seen. On the one hand, I’m at a bit of a disadvantage, with school and my limited time and budget. On the other hand, I think I’m getting a real leg up – I wonder how many foodies discovered their passion for cooking as young as I did! In this sense, I’m pretty lucky to be 16. Anyway, the nice thing about turning 17, besides cake and finally fitting into my title, is the birthday present I’m planning. A real camera. My Kodak EasyShare is fine when I go to the park or for photos on vacation, but when I’m trying to zoom in on some crumbly shortbread action, it’s a little lacking. I’ve been looking around and I think I’ve decided on a Canon Rebel XTi with a Canon 50mm 1.8 lens. It’s a bit pricey for a hobby but my parents and I will share the cost… and hopefully I’ll be able to take the food photography that I see in my head! What about you? What kind of camera do you use, and what do you suggest I buy? But onto the recipe. I’m still on a matcha kick after getting a whole package of the stuff. Seriously, I dream in pale green. 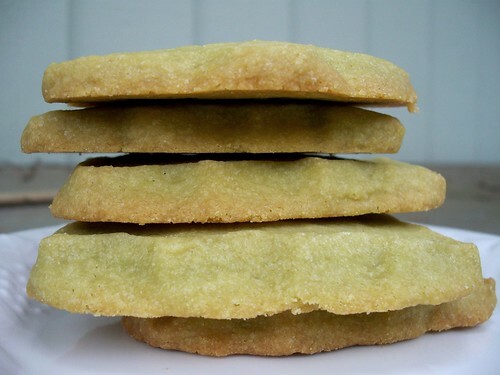 These Green Tea Shortbread cookies are being shipped off to my mom’s best friend for her birthday. She loves buttery, melt-in-your-mouth cookies, and these were perfect. Originally, the recipe uses leaf shaped cookie cutters. Along with the subtle green from the matcha, the cookies were adorable. My mother and I considered driving to the next city over to get leaf cookie cutters before we realized how ridiculous that was. I ended up using tree shaped cutters. The recipe is very straight forward. There’s only 5 ingredients, and it produces a dry butter cookie that literally melts in your mouth. The green tea flavor is light, but definitely there, and the color is really beautiful. I personally like moist and chewy cookies better than shortbread, but I still ate a couple myself. 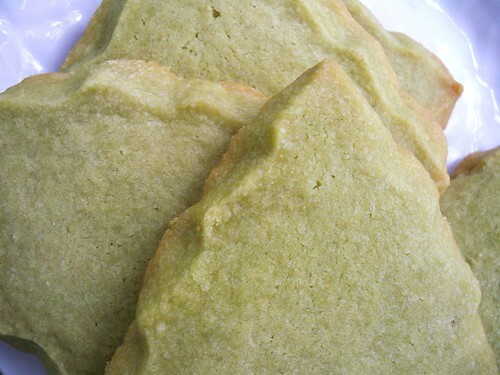 Sift the flour, matcha, and salt together in a bowl. With an electric mixer, beat the butter on medium speed until fluffy (about 5 minutes.) Add in the powdered sugar and beat until very fluffy and light (3 minutes more for me.) Add in the flour mixture and stir on low speed until just combined. Roll out the dough to 3/4″ thickness on a lightly floured surface. Freeze the dough until firm, around 20 minutes. Preheat the oven to 325 degrees. Using a 3″ cookie cutter, cut out as many shapes as possible – I used a Christmas tree shape. Reroll the remaining dough and freeze again while the first batch bakes. Bake cookies for 20 minutes or until begining to brown around the edges. Cool cookies on a wire rack until room temperature. Entry filed under: Cookies. Tags: Cookies, matcha. I really need to get on board with this matcha thing. I have a 9 year old Sony and I need/ want a newer cooler one. I started baking early. Mostly box mixes and such. Occasionally a homemade cookie. Peanut butter was my first. But it wasn’t until I was about 16 that I really got into it. That was 11 years ago.